Consumption behaviors are changing, new generations have a digital life of their own and the demand for data privacy is increasing. What if brands could propose a modern way of owning their creations? What if, thanks to technology, we could augment the ownership of goods? At Arianee we are building perpetual relationships between brands and owners, made of trust, respect and transparency. 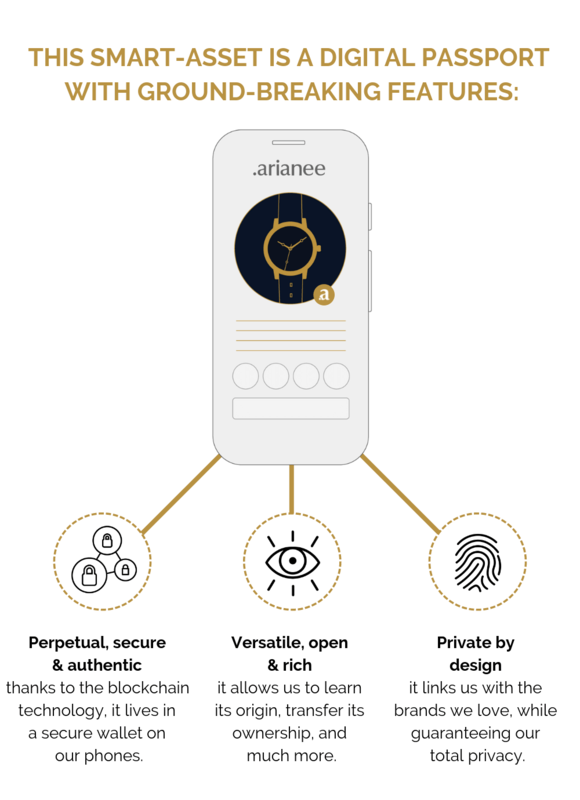 With the Arianee protocol, ownership is augmented and groundbreaking features are added to the most valuable items. Join us at conferences, meetups, and events, to learn more about the Arianee protocol and meet the team. The Arianee project is an independent, participative - organization whose mission is to build a global standard for the digital certification of valuable objects by promoting and supporting the adoption of the Arianee protocol. Arianee uses blockchain for decentralized, independent and secure verification. It allows all users to trust each other without relying on a single centralizing third party. All the nodes in the network are needed to verify any event on the protocol so fraud by an individual actor is impossible and data is secured. In addition the distributed architecture of blockchain ensures higher uptime and censorship-resistance. Open source is fast becoming a standard in the tech industry. This is because it has proven that it attracts a wider and more committed developer community and yields more innovation. While open source technology is at the core of all the most used internet platforms, data has become the new frontier for the open movement. Arianee's protocol is open service and offers open access to data streams. User centric design is now a must. However user centric does not mean that the company has the user’s best interests at heart. For instance, while Facebook is focused on user experience, it has been proven to fake metrics to enhance sales. To prevent such frauds, Arianee is fully transparent and auditable. Moreover, the project's governance is shared with the members of the protocol's ecosystem. Don’t miss a bite of the protocol’s news. We invite brands, designers, developers and all organizations interested in the future of ownership to join the Arianee project to take advantage of the endless possibilities opened by the Protocol. Becoming a Member will give you access to all the tools, resources and support you need to get ready to implement the Arianee Protocol at scale. Discover how the blockchain and the Arianee protocol can contribute to your business. Start creating and distributing Arianee digital trusted certificats on a limited edition. Contribute to the design of a global standard and take advantage of a unique support.